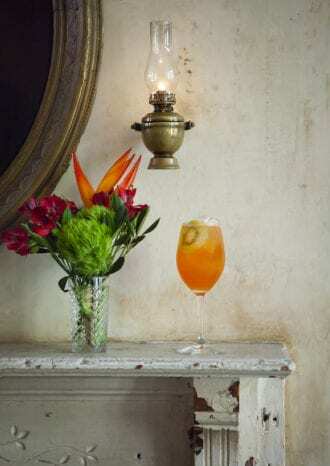 Nico de Soto (of New York’s Mace) offers this twist on the Aperol Spritz, as well as a little play on words. The question of “Qui Oui?” (Who, yes?) is answered phonetically by it’s special ingredient—kiwi. Add all the ingredients except the prosecco to a shaker and shake with ice. Strain into a wine glass with fresh ice, top with prosecco and garnish. Kiwi Syrup: Peel and purée 3 kiwis in a blender. Strain the purée through a coffee filter into a measuring cup. Add an equal quantity of sugar and stir to combine. Transfer to a saucepan and heat over medium heat, stirring until the sugar has dissolved. Transfer to a sealable container to cool. The syrup will keep in the fridge for up to 1 week. Reprinted with permission from How to Drink French Fluently by Drew Lazor and Camille Ralph Vidal, copyright 2017. Published by Ten Speed Press. We caught up with this year’s winner to hear more about how she mixed her way to the top and what her future holds now that she’s taken the Speed Rack title.